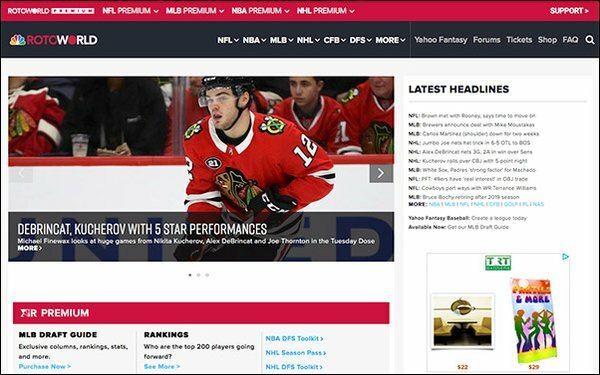 NBC Sports Digital fantasy sports site Rotoworld launched a new website this month, providing users with improved functionality and navigation and featuring the debut of the site’s video platform. Following a banner 2017-2018, when Rotoworld saw its video starts jump by over 5 million, the site reports that starts have tripled in the last year. To capitalize on this success, Rotoworld placed video at the top of its priorities as it redesigned. Video content that was previously hard to find for visitors is now easily found on both desktop and mobile versions. The company sees video as a continued area of growth. The site was also redesigned with sponsored content opportunities in mind. According to Rotoworld, its top-rated content always has a brand attached during the NFL season. The redesign will make this content more visible through the site’s enhanced layout. The redesign, undertaken internally, features a new mobile optimized site with streamlined menus, making it easier to use. Along with allowing visitors to peruse the site without the need to pinch and zoom in on relevant information, Rotoworld also implemented improved filters around its player news, along with improved searchability. Users no longer need to search players through a “last name, first name” format. The field will begin to populate suggestions as a user types. Additionally, a three-pack top story design provides visitors with more of Rotoworld’s experts’ columns. Other elements impacting users include more robust player news pages that include an individual play’s entire game log, current season stats and career stats and direct access to Rotoworld’s premium products. That means draft guides, season passes and daily fantasy sports (DFS) toolkits for the NFL, NBA, NHL and MLB. The MLB DFS toolkit, which is the site’s fourth kit since launching the product line in August 2018, helps users to build smarter lineups through an algorithm that takes into account statistics and factors for Yahoo, FanDual and DraftKings contest.